Chieti is a rather small centre (it has less than 60 thousand inhabitants) but it is a concentration of art, culture and history. A charming small town situated on a hill, to the right of the river Pescara and a few kilometres from the Adriatic Sea, which can be seen in the distance. The blue sea in the background of the landscape contrasts with the green and brown mountains of Maiella and Gran Sasso (both national parks). On the legendary origins of Chieti there are different versions, but the most widespread legend goes back to his foundation to Achilles (or his companions), who called the city Teati in memory of his mother (Teti). The civic coat of arms shows Achilles on horseback, holding a shield with his left hand, on which appear the four keys symbolising the city gates. Chieti is the capital of the province and, in addition to being a renowned tourist centre, it has industrial activities especially in the metalworkers, glass, paper, food and agricultural sectors (grains, cereals, tobacco above all). 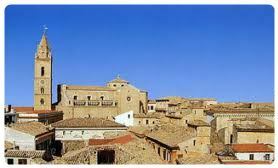 But we know the city in detail with its squares, monuments, traditions and curiosities. 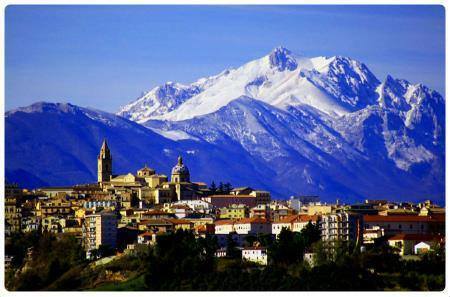 Piazza Vittorio Emanuele II is the main square of Chieti and the highest point of the city. The square houses the Cathedral, the Municipal Palace and the Courthouse. The view runs through the massive and imposing square; stories of distant times make their way into the mind, the view opens up onto the Maiella and goes as far as the sea. The ancient Piazza Vittorio Emanuele II gained importance from the ninth century, when Bishop Theodoric I ordered the rebuilding of the early medieval cathedral. The structure of today's church, dedicated to the patron saint of the city, S. Giustino, dates back to the 11th century. Practically rebuilt in the 1300s and then remodelled several times, the Cathedral of S. Giustino was completed in the 20th century (façade and right side on Piazza Vittorio Emanuele II). The fourteenth-century bell tower of the Cathedral, by Bartolomeo di Giacomo completed at the end of the 15th century by Antonio da Lodi, dominates the city panorama. The church is accessed from the portal, preceded by a beautiful staircase. The interior is a Latin cross, with three wide naves covered by vaulted ceilings, transept and raised presbytery. On the high altar, St. Justin was represented here and hermit who received the episcopal insignia (18th century). Two staircases lead into the crypt, where the restorations have brought fragments of 12th to 13th century frescoes to light. From the crypt you can access the Suffrage Chapel adorned with seventeenth-century stuccoes. The neoclassical Town Hall and the Palace of Justice overlook the square and, as mentioned above, it is the ideal point to enjoy a fantastic view of Maiella and Gran Sasso. Il centro di Chieti è tagliato da Corso Marrucino, strada dedicata al passeggio, in parte porticata. Lungo il corso s'incontrano la chiesa barocca di S. Domenico, il Teatro Maruccino (XIX secolo, in Largo Valignani) affiancato da Palazzo Martinetti (sede della Pinacoteca Provinciale "Costantino Barbella"), e la Chiesa di S. Francesco della Scarpa, barocca, che conserva il rosone della primitiva costruzione duecentesca. Altri monumenti cittadini sono la Chiesa di S. Giovanni dei Cappuccini, con tele della scuola di Paolo Veronese (da notare la bella Vergine in gloria e Santi), Porta Pescara (XIII secolo) unica sopravvissuta tra le porte della vecchia cinta muraria, Torre dei Toppi, sull'omonima via, di origine quattrocentesca ma pesantemente manomessa, il Palazzo del Seminario diocesano, con la bella loggia cinquecentesca, infine la Torre del Palazzo Arcivescovile (XV secolo), ornata alla sommità da coppelle in maiolica. 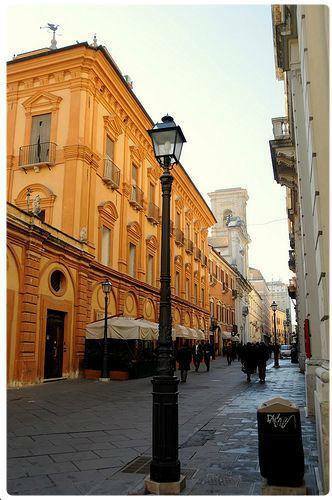 The center of Chieti is cut from Corso Marrucino, a street dedicated to the promenade, partly porticoed. Along the course you will find the Baroque church of S.Domenico, the Maruccino Theatre (XIX century, in Largo Valignani) flanked by Palazzo Martinetti (headquarters of the Pinacoteca Provinciale "Costantino Barbella"), and the Church of S.Francesco della Scarpa, baroque, which preserves the rose window of the early thirteenth-century construction. 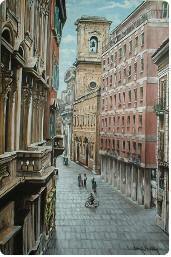 Other city monuments are the Church of S.Giovanni dei Cappuccini, with paintings by the school of Paolo Veronese (it is worth noting the beautiful Virgin in glory and saints), Porta Pescara (XIII century) only survived between the gates of the old city walls, Tower of the Toppi, on the homonymous street, of fifteenth-century origin but heavily tampered with, the Diocesan Seminary Palace, with the beautiful sixteenth-century loggia. A Chieti il 17 gennaio si tiene la Festa di Sabt'Antonio, ricorrente in molte località abruzzesi (Villavallelonga, Collelongo ad esempio), quando si svolge la drammatizzazione delle tentazioni che misero a dura prova il Santo nel deserto. La Via Crucis (aprile) che si snoda per le strade del centro storico, con Miserere cantato da sole voci maschili e accompagnato da cento violini, è considerata la manifestazione del Venerdì Santo più antica d'Italia. 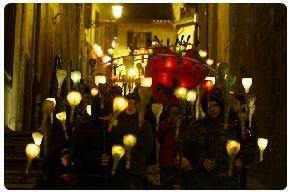 La processione parte dalla Cattedrale di S. Giustino e si svolge, immutata nei suoi costumi penitenziali e con i suoi trofei di pregio artistico, lungo le strade cittadine avvolte da un'aurea mistica. L'11 maggio è la Festa di S. Giustino, patrono di Chieti, mentre il 26 luglio alla Festa di S. Anna avviene il caratteristico ballo della pupa, in occasione del quale viene incendiato un fantoccio coperto da fuochi d'artificio. Per approfondimenti leggete la pagina dedicata alle feste e tradizioni di Chieti. 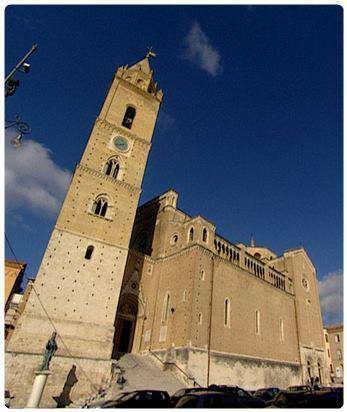 In Chieti on January 17 the Sabt'Antonio Feast is held, recurrent in many places of Abruzzo (Villavallelonga, Collelongo for example), when the dramatization of the temptations that put the Saint in the desert to the test is taking place. The Via Crucis (April) that winds through the streets of the old town centre, with Miserere singing male voices alone and accompanied by a hundred violins, is considered the oldest Good Friday event in Italy. The procession starts from the Cathedral of S. Giustino and takes place, unchanged in its penitential costumes and with its trophies of artistic value, along the city streets surrounded by a mystical golden. May 11th is the Feast of St.Justin, patron saint of Chieti, while July 26th at the Feast of St.Anna takes place the characteristic dance of the puppet, during which a puppet is burned covered by fireworks. 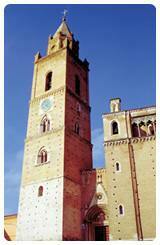 For further information, read the page dedicated to the feasts and traditions of Chieti. Copyright © Informagiovani-italia. com. Reproduction in whole or in part, in any form, on any medium and by any means is prohibited without written permission. If you liked this guide and would like to help Informagiovani-italia. com help us spread it.